Croizet may be one of the lesser known big cognac houses of France, but it appears to have cult status among those who appreciate the finer things in life. In 2011 a bottle of Croizet’s 1858 vintage, named Cuvee Leonie after the daughter of Croiziet’s founder Leon Croizet, sold for US$156,760 at an auction in Shanghai. Leon Croizet founded the cognac house in 1805, leaving his job as the Sommelier to Napoleon Bonaparte to start the distillery which now rests in the heart of the Grande Champagne region of Cognac in France. Croizet have released vertical vintages from 1914 to 1988 and the cognac house claims that each vintage reflects ‘the very special conditions of a particular year when the champagne grapes were harvested’. Croizet therefore appears to be most concerned with ensuring the fruitiness of the eaux-de-vie is not lost to the wood, but accentuated by the wood, as it ages. That fruitiness over the wood is exactly what you get with the 1984 vintage. 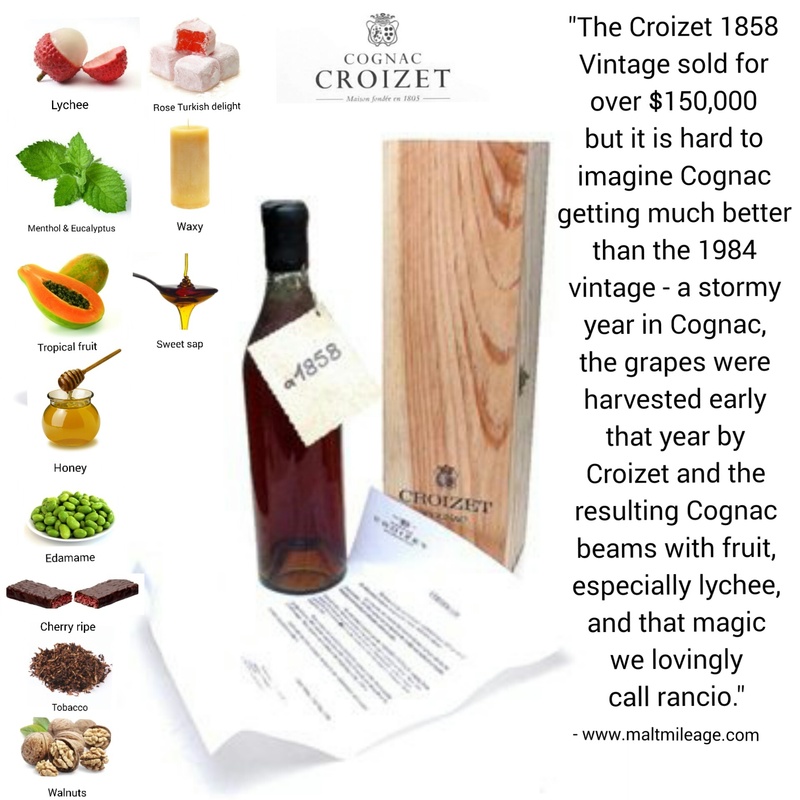 1984 was a stormy year in the Cognac region of France, resulting in an abnormally hot spring and summer which allowed Croizet to harvest grapes early that year. Plump and full of sweetness, the grapes of 1984 give this vintage a particularly fruity character. The old age of this cognac is evident on the first sip, because its silken texture is beyond smooth and it shines with that highly sought-after characteristic of fine cognac that develops with decades of aging, rancio – the gouleyante or “lively” aspect of a cognac that, much like the uniqueness of this single vintage, expresses itself in a distinct way with notes of soy sauce, earthiness and tropical fruit amidst the glowing magic of eucalyptus and the eaux-de-vie. The nose presents with strong notes of lychee, papaya, forest undergrowth, tree sap, honey, dried fruit, hints of spice and wax candles. On the palate the cognac is silky smooth, with the continuing theme of lychee but this time intermingling with the eaux-de-vie and more shades of tropical fruit. At mid-palate the spices and wood come to the fore, drying the palate and introducing with more detail the magic of rancio – walnut oil with hints of soy sauce and undertones of earthiness. Cherry ripe and rose Turkish delight emerge with the intensifying glow of menthol and eucalyptus, and an almost resinous sweet sap. The rancio and fruit linger into the finish, accompanied with almonds and edamame, and hints of creaminess signal that the grand show is nearing its end.